Romero tested negative for the virus this weekend, meaning little, if any, trace of Ebola remains in her blood. While she may be free to leave the hospital soon, 100 other people who came in contact with her, including Limón, remain under observation. 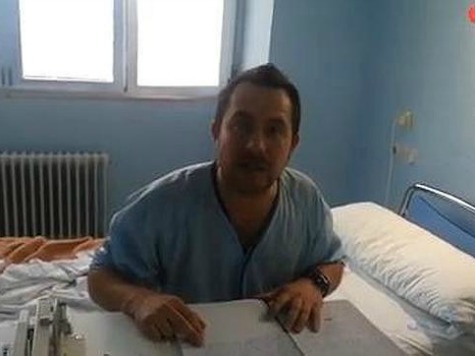 In response to the news of her improvement, Limón released a video in which he noted that, for much of her illness, “I have preferred to live these days in solitude, and concentrate all my strength and energy into helping her recover.” Now that she is improving, however, Limón indicated that he is willing to take his battle against the Spanish healthcare system public. The video is short, and, according to Spanish outlet ABC, confirms Limón’s intentions to sue Madrid’s healthcare system. He notes his response is a recognition that “in these difficult moments we have lived, especially her, there are many who are watchful of us, and some expecting some reaction from my end.” He promises to “leave the last drop of my blood to defend her honor and dignity,” and to “prove in the court of law the great blunder that has been the Ebola efforts in Spain,” using the Spanish vernacular word “chapuza” to describe the botched job done by Romero’s bosses. Limón, through a family spokesperson, has previously alleged that the hospital officials who should have seen to Romero’s care while treating an Ebola patient had been greatly negligent at their job, giving Romero only 30 minutes to learn how to properly wear the complex protective gear necessary to treat an Ebola patient before working with two missionaries who recently arrived from Sierra Leone and Liberia with the disease. The family spokesperson also noted that the couple are, in fact, contemplating legal action against the head of Madrid’s health ministry, Javier Rodríguez, for implying that Romero’s contamination was a product of her lack of intelligence when he said, “You don’t need a Master’s to put on a protective suit.” He also joked that Romero “can’t be that bad” because she had visited a beauty salon days before being admitted to the hospital with the virus.